The day was beautiful. The La Hoihoi Ea event, the ceremony to honor our Hawaiian flag and all that it stands for, was done well with a full circle of Native Hawaiians holding hands. Brought tears and gratitude for our ancestors and for all that we are. The discussion tent featured many outstanding grassroots speakers who spoke from their na’au about their work and the work that needs to be done for our people. All in all, an event done well. (Note: Olelo recorded the discussions in the tent. I’ll try to remember to let you know when they are aired since they are worth watching). Our club had three fundraising tents: Food, educational with Native books, and NoaNoa. All did well. We will do report on the funds raised at our August general membership meeting. Mahalo nui loa to the following members, especially to Juanita and Bob Kawamoto Brown for preparing the Lilikoi Kalua Sliders, cole slaw, lilikoi and strawberry lemonade…days of preparation, cooking, hauling, and storing of materials. Na kokua lima included: Asghar for his donation of 33 banana bread; Kaiona and Ihilani for their donation of banana cake and the delicious haupia; Ladd for serving as our cashier and picking up the water and canned drinks; Kaimo for coming home specifically to be with us and to bring the needed supplies; Linda, Cindy, and Pamai for their kokua to the Native Books sales; Juanita for the NoaNoa sales; Betty, Joe, Cedric for their kokua to the food tent; Mahealani and Kaylyn for their helpfulness in setup and procuring the water; and especially to Ken and Jun who came early in the morning and carried tons of stuff to our tents and who set up our tents. Know that our elders really appreciated your kokua! Lastly, mahalo to Hawaii Maoli for the loan of their tent, and to the La Hoihoi staff who helped us throughout the day and especially at the end in moving things to our car. The next fundraiser is at the Papakolea Community Park on August 12. We will be selling lemonade and baked goods, Native books, and NoaNoa at that event. Volunteers needed. As indicated in an earlier email, these fundraisers are focused on helping to raise funds for our delegates to the AHCC convention; the cost for each delegate to attend is well over $1000. Currently, our budget includes paying for their meals and registration. However, big costs of hotel and air are currently borne by the delegates. Thus, some kokua to help those costs would be helpful. Enjoy the pictures taken by Cedric. This entry was posted in General on July 31, 2017 by Blaine Fergerstrom. 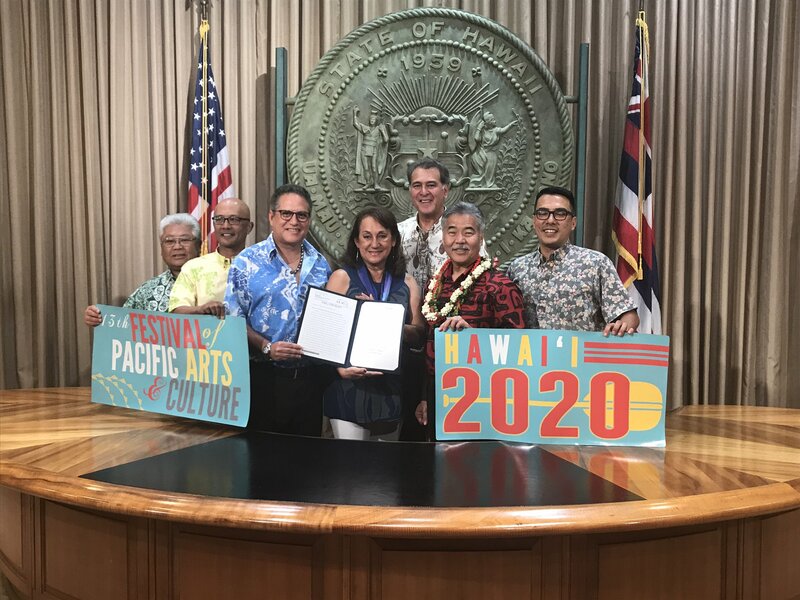 Governor signs into law bill declaring the Pacific Festival of the Arts 2020. Kalihi Palama HCC was a co-sponsor with Kailua HCC on a resolution in support of the Festival. We will be busy in 2020 as we support our member Vicky Holt Takamine in her leadership on this event. This entry was posted in General on July 6, 2017 by Blaine Fergerstrom.